I do not know how, but GitHub is now a hub for all things. I need just a server hosting service affordable…. Let’s suppose that we have a program that have Departments and Employees. And we want to make sure that, when we add an employee, the department must exists. We can ensure this from database ( by foreign key) but we can pro-actively search for the department and throw a more meaningful validation . More, I like more validation than errors. So, let’s suppose that in the Validation for the Employee we must check in the database for the IdDepartment to see if there is such a department. How could we make a test for that runs without a database ? With some trick: we first Record with a database – then we can Play the file – and we do not need anymore the database. The test is self contained. 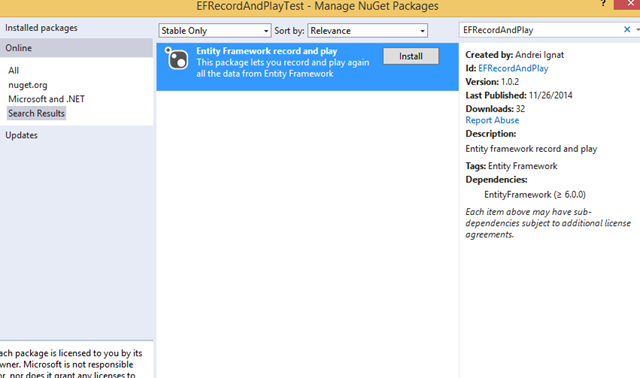 With this helper you can record and then play the actions in Entity Framework(>= 6).